The holidays bring on a lot of extra activity and responsibility. I enjoy any opportunity to get a break from standing in the kitchen to prepare food for the family after work, and holiday baking, and present buying and wrapping, etc. Craving a delicious, deep dish fix for dinner? Looking to save you and your family time and money during this busy holiday season? Pick up Red Baron® Deep Dish Single Serve Pizza from your local Sam's Club! Don’t miss this great Ibotta offer! 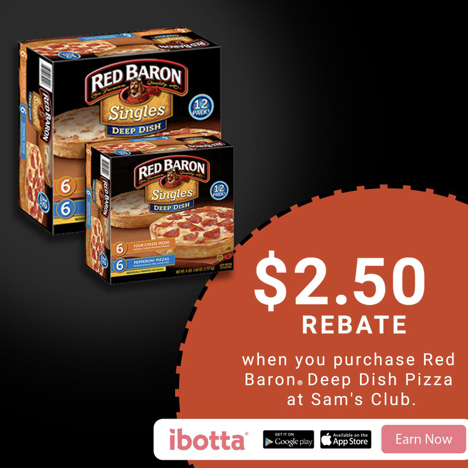 When you buy Red Baron® Deep Dish Pizzas at Sam's Club, you will earn $2.50! *Offer available through 12/31/17.